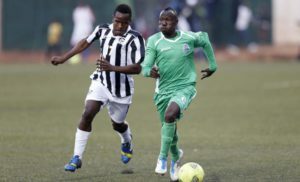 Godffrey Walusimbi (right) has been with Gor Mahia since 2014. Uganda Cranes international Godffrey Walusimbi aka Jaja Walu refused to travel with his side Gor Mahia as they left for Tunisia to play ES Tunis in the return leg of the CAF Champions league. Walusimbi refused to board the plan demanding he is payed his salaries and allowances that the club owed to him. A top Gor Mahia official who preferred to remain unidentified clarified that Gor Mahia will have to do without the left back against ES Tunis. “We persuaded him to travel but he refused, said the official. “Walusimbi insisted that he wanted the money the club owed to him and kept on insisting that he wanted it paid fully. “We have been forced to travel to Tunis minus him because we have to play whether with him or not. Walusimbi was among the final 21 man squad that coach Dylan Kerr had summoned for the game in Tunisia but chose to stay behind. Jaja Walu has been with Gor Mahia for the last four years after joining the Kenyan defending champions in 2014 from SC Villa. He had a un successful stint with Congolese side Don Bosco in 2013 after he had left Vipers, then Bunamwaya in the same year(2013). Walusimbi is part of the 24 players that Ugandan coach Sebastian Desabre called up for the Cranes upcoming friendlies later this month. Gor Mahia drew 0-0 in the first game in Kenya and will need to score at least once in Tunis so as to stand any chance of progressing to the group stages of the CAF Champions league.